Dearest Blog: Yesterday it was off to Marquee Cinemas for The Meg. Spoiler level here will be mild, nothing you wouldn't know from the trailers or if you've seen one of these kinds of monster movies before...ever. It's Statham vs. giant shark, and the winner is the box office! Ladies and gentlemen, there's not a lot in this world that gets me more wound up than a new Jason Statham movie, and while sometimes he seems to go out of his way to prove I'll watch him in absolutely anything, this one's not so bad. Let's get the negatives out of the way first: The Meg has its tense moments, but it's not super exciting. Part of the problem is the film is utterly lacking in surprises; every minute plays out exactly how you'd expect, making it feel longer than it is. The cast does the best it can with some truly awful dialogue, and, while my crowd seemed to enjoy the cheap laughs, I rolled my eyes so hard I'm surprised I'm not typing out the back of my head today. Finally, a giant, prehistoric shark should be about the most imposing thing you ever could see, yet somehow it never really earns a 50-foot screen; in fact, it seemed positively puny compared to the Bumblebee trailer that ran before. Now the good news: Obviously: Jason Statham. I was afraid the large-ish cast would mean not enough Statham, but even if he's sharing the screen he's still on the screen most of the time. Win! The rest of the cast is pretty good and does what it can with the material; the fact that sometimes it's not much is never their fault. Regular reader(s) will know I'm no great fan of kids or kid actors, but flat-out adorable Shuya Sophia Cai steals this show right out from under its adult ensemble. The scramble for a PG13 rating kept blood and gore well within reason, too. (Yes, I know some would have put that in the "negatives" paragraph!) The Meg is a decent bit of fun buoyed by a good cast and some pretty scenery, even if it's too silly and drags on a bit at times. 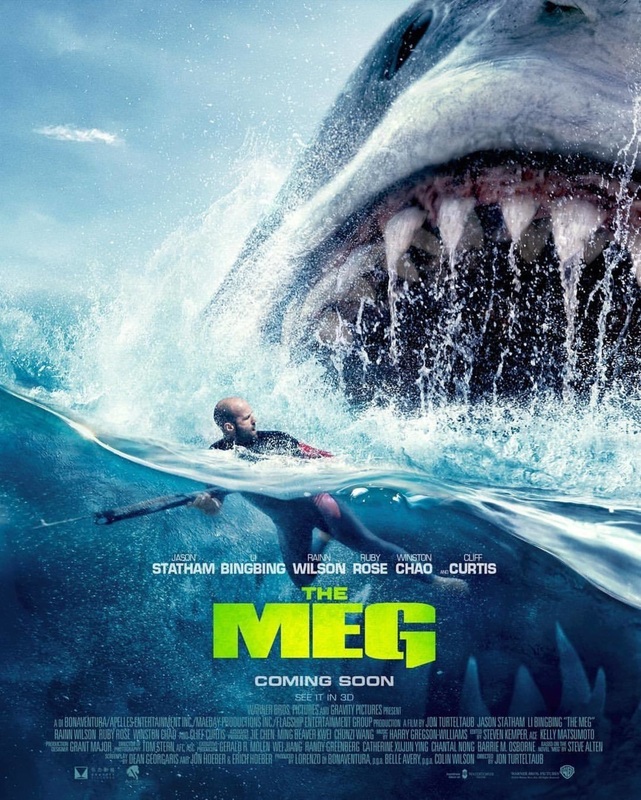 The Meg clocks in at 113 minutes and is rated PG13 for "action/peril, bloody images, and some language." The Meg is just the sort of unremarkable brain candy you'd expect from Hollywood this time of year. Of a possible nine Weasleys, The Meg gets six. Oh, and, for the record: "You should put on some clothes," is never, EVER the correct thing to say to Jason Statham.